Most of the major indexes look precarious. They look like they jumped back up and are hanging on by their fingertips. Can they pull themselves up through resistance or will they retest their lows? We’re watching all the signals. The blue lines in the SP500 chart above represents the bull markets primary price channel since early 2016. It will take more than the Federal Reserve’s “patience” to recapture that old channel. The market needs the Fed’s monetary fix and a big one to recover. Especially with a slowing US economy in 2019. Note: In all the charts you will see the market “panic” after the Fed chairman said he still had a long way to go in raising interest rates, and “PPT” when the Treasury Secretary tweeted he was convening the plunge protection team, and “Fed patience” when the Fed Chairman capitulated and said he was now listening to the markets and would be patient with monetary policy. It’s true the US economy was stable in 2018 while the rest of the world floundered due to the Fed’s monetary tightening. But the US economy was not that strong, and the global economy outside the US is in a major slowdown (or possible train wreck). The US has not decoupled economically from the rest of the world. Financially maybe, but not economically. That SP500 chart is just plain ugly! Everyone is waiting around trying to figure out if the Fed is going to save it one more time, or not. The consensus appears to be yes they will, but I am not sure they can. It was the abrupt drying up of liquidity in the credit markets that scared the Fed and caused the Chairman to capitulate on his message, and to a lesser degree the swoon in the stock market. What is liquidity? Liquidity in the markets is basically the ability to unload your securities at a price not too far from where the market was trading recently. So the lack of liquidity means no one is willing to pay a price anywhere close to the price you saw posted yesterday. What’s the free market solution? Let the price drop like a rock until someone is willing to buy. What’s the Fed’s solution? Don’t let the free markets do their work and quickly blather sweet nothings in wall street’s ear while figuring out what to do. When you blow the largest financial bubble is history you either become the market or you let the bubble pop. Of course, the Fed still hopes it can slowly deflate the bubble… calm it down with soothing words like “patience” and “we are listening” and then hopefully raise interest rates a wee bit higher – you know, a tad above inflation after 10 years of negative real rates. Move slower than before… with “patience”. So this is where we are in history. Waiting to see whether the Fed becomes the market or lets the free markets work, but more likely a bad mix of both. The saga continues with the 30 January FOMC statement and the market’s interpretation of this statement and other Fed statements going forward. All clear? I don’t think so, not yet. The largest 100 companies listed on the Nasdaq were the best performers this bull market thanks to being over 55% tech. With a majority of their revenue being generated outside the US, it is not just the global economy slowing but also supply and manufacturing lines that are vulnerable to an economic war – not priced in, not even close. So much for diversifying in international funds. Not that it has helped anyone’s portfolio since 2000. European buy & hold types are still waiting for that breakout above 2000 price levels. But at least they had fun on the roller coaster – two 60% dives and a couple of teasers. The STOXX 600 accounts for about 40% of the TSP International fund which invests in the developed world outside of the US. The addition of emerging markets would not have changed much in the picture above. The blue line in the next chart is the under-performing TSP I fund and the black line is the TSP I fund missing bad half of each year by sitting in the risk-free TSP G fund. Of course, if you used a seasonally-modified buy and hold strategy with your international fund then you did okay – hint, hint. Most of the damage in the international index funds occurred during the unfavorable season for equities – the Summer and Fall. The TSP Smart Seasonal follows our objective Bellwether signal which is derived from the Total US stock market. Yes, the international fund is highly correlated to the US stock market. Note: You can diversify geographically (blue line) or you can diversify seasonally (black line). Diversifying seasonally does require two allocation changes per year. Diversifying geographically only requires giving up over half your potential nest egg over the next 20 years if history repeats. 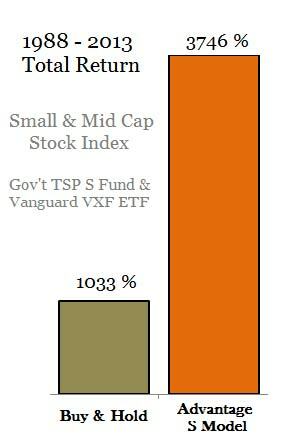 Interested in our different perspective on the TSP funds, you can check out our Best TSP Allocation and Strategy updated for 2019. If you are interested in following our commentary on the central bank saga and its effects on the stock market you can sign up for our most basic service and follow the discussion under market commentary for members. You can also sign up for this free blog in the right hand column of the page.